@wangnyeo. I feel the same. Amazing how LJS can transform a story that seems mediocre into something interesting... Haha. He's a good actor no doubt. Have watched all his works since I Hear Your Voice, which was also a noona dongsaeng drama. this drama reminds me of that classic.. yet with a different feel. I wait for the romance between her and LJS ! when will WE come ??????? its quite common i think. Eli from idol group U-Kiss married an older women . Ham So Won , former Miss Korea 1997 (she's in her 40s) married a 24 years old man last year. And its not even happen in Korea. plenty of people in my country also like that. it happen around the world, just not really highlighted like kdrama has done. its quite common i think. Eli from idol group U-Kiss married an older women . Ham So Won﻿ , former Miss Korea 1997 (she's in her 40s) married a 24 years old man last year. It’s sadness me the scene Kang Dan Yi was begging her no good for nothing husband to stay with her while he couldn’t wait to get out , what a selfish person he is , no surprise he cheated , the marriage was doomed from the start , the divorce was obvious outcome because their issues as couple stemmed from issues as individuals and personally I felt she needed to go her separate way and accomplish thing separately and find her own happiness without anyone else . And for cha Eun Ho I am abit hesitant to comment on my feeling toward him, I didn’t like their friendship wasn’t that deep that as close friend he didn’t go to her home once to know she wasn’t married anymore, her child is in boarding school , yes didn’t got a home first place what friendship is that ,but I am under the impression he is the kind of person who keeps most his true feeling to himself , including his crush on her . I would say he is in neutral place about Dan Yi , he seem comfortable in this polite , mild friendship, which is the last thing a woman like Dan Yi need right now I think . After readying herself in a public restroom, Dan-yi stands at the bus stop and inspects the blister on her heel. The bus arrives and in a rush to get on, people kick Dan-yi’s shoe into the street. Traffic prevents her from retrieving it and when the buses pull away, the shoe is gone. Dan-yi attempt to call and reschedule the interview, but the company is unsympathetic. Dan-yi cries that it would be a hassle to commute and they won’t hire her anyway, so she refusesto attend. Hanging up, she dissolves into sobs. Things are starting to look up for our leading lady as she lands a job. But contract employment can’t solve all of Dan-yi’s problems right away, and soon our aloof editor has a mouse in his house-a pretty cute one though, and one that I doubt he minds as a roommate. Memories surface to propel Dan-yi towards the future that she wants, and to remind Eun-ho why he adores his first love more than he would ever admit to anyone else. one call and ends the interview before answering the question. As he walks away, he receives a text from Dan-yi, asking him to change his house passcode back to the one that she knows, so that she can resume as his housekeeper until she finds a job. In the meanwhile, Dan-yi sleeps at the jimjilbang for the night. The next morning, the Gyeoroo employees compete in a game to decide who will call the new hires and give them the good news. Ji-hong officially wins the game, but his victory is short-lived, as Jae-min decides that it’s his duty, as company president, to call the new hires himself. Eun-ho follows Jae-min into his office and pulls Dan-yi’s application out of the stack of selected candidates. Jae-min tells Eun-ho that he insisted on hiring this particular candidate after reading her answers to the company questionnaire. The first question asks the candidates to write what they’d like to tell themselves, and Dan-yi’s response is a heartfelt apology for being hard on herself. As her response reads in voiceover, Dan-yi’s life experiences play out, from the recent moments of homelessness, to times that her daughter threw a tantrum in public, or when Dan-yi had to deal with difficult customers at the supermarket where she worked. “I’m sorry I didn’t value you enough, I’m sorry I mistreated you, I’m sorry I let you feel small.” She encourages herself to take care of herself and work towards being happy. Jae-min comments that she must have lived a hard life, and those types of people often make the best workers. The only thing that Eun-ho can offer up as praise is that there are no grammatical errors, and he leaves Jae-min to make his calls. First up on his call list is Oh Ji-yul. When the call comes in, Ji-yul is on a group date, leaning in to kiss the guy next to her. Instead of the joy Jae-min was anticipating, Ji-yul doesn’t seem to care much about getting the job. She asks if she can delay her start date to accommodate her upcoming travel plans with her mom, and Jae-min tells her to report to work the next day. Next up on the list is Park Hoon. As the young man crosses the street, he bumps into an old girlfriend. She notes the resumes he drops and asks if he’s still job hunting. Park Hoon lies and says that he’s found one at a public corporation, and she congratulates him, and even suggests that she should get in touch with him again. Of course, Park Hoon actually works at a beauty store, and his ex shows up to witness him in his frilly pink uniform. Shortly after she leaves the store, Park Hoon receives Jae-min’s call. He’s excited at first, but then he can’t help but complain that Jae-min called him just a minute too late. Jae-min’s last chance to get a genuinely grateful response is with Dan-yi, who is working at the jjimjilbang when the call arrives. Dan-yi gasps in shock and then thanks him profusely. But then the sauna ajummas surround Dan-yi and a raucous celebration breaks out. Dan-yi shouts, “Power pose!” and Jae-min is skeptical of her bizarre behavior as well. At Eun-ho’s home, Dan-yi’s able to enter Eun-ho’s house again and finds more money for her housekeeping services. When she hears Eun-ho at the door, she darts upstairs to the spare room. She shoots Eun-ho a text about her job-related good news, and she watches from above as Eun-ho responds gruffly that he won’t give her any help at work. He also tells her to find him a new housekeeper. As Dan-yi snuggles into her blankets on the floor though, Eun-ho sends another text, congratulating her on the job. She smiles and texts that she made his favorite stew, and Eun-ho smiles as well. It’s the next morning, and guess who lives in the neighborhood? It’s Cinderella Prince Seo-joon, out for a walk with his dog. Dan-yi takes her moment while Eun-ho showers and sneaks out the door, but not before stealing Eun-ho’s slice of toast. She’s excited to start work, and Seo-joon recognizes her as she dances past. Outside Gyeoroo, Dan-yi runs into Park Hoon. He’s excited to get to work, and dazes Dan-yi with a barrage of unfamiliar slang. Once inside, other recruit Ji-yul scurries into the elevator after them. Before the elevator doors close, Hae-rin joins them as well, but everyone assumes she’s also a new recruit. Park Hoon does his best to introduce himself to everyone, but Hae-rin remains aloof. At orientation, Dan-yi and the others join the rest of the new hires, and Park Hoon leans in to dish some dirt. He’s heard that the orientation trainer, Hae-rin, is known as the “second witch” of Gyeoroo, and that she’s a cranky workaholic with the nickname “Ice Queen.” Oh boy. When asked who the first witch of Gyeoroo is, Hae-rin finally chimes in that it’s Yoo-sun. At first, Park Hoon assumes that she’s also done her homework, but when Hae-rin hands out everyone’s business cards and drops the employee manual on the table in front of them, he finally realizes that the ice queen has been present for all the gossip, ha. 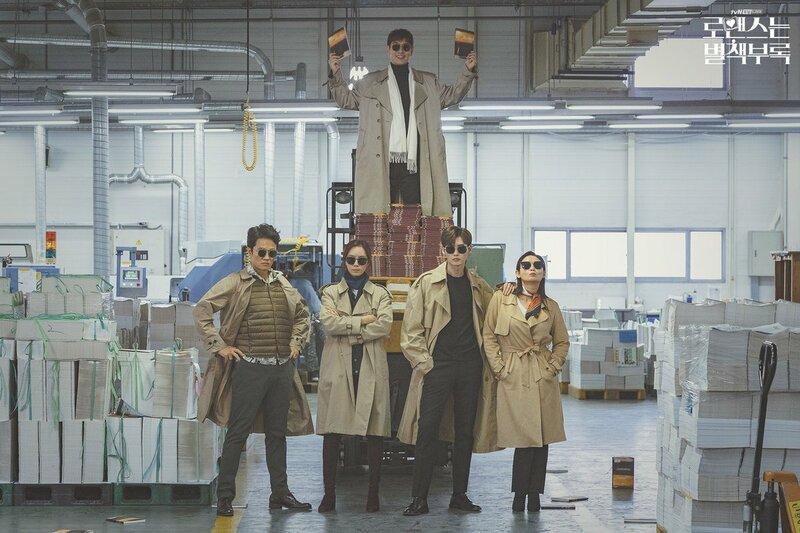 Hae-rin deadpans that she is indeed a workaholic, and she reminds them that they are all colleagues and competitors, all trying to outlast one another as they prove that they are qualified for the job. Eun-ho arrives at the office in time to watch the orientation, and he smiles as a junior staff member gushes over how cute the newbies are. But then she points out Dan-yi and calls her dowdy, which Eun-ho will not stand. He says that she’s just his type, classy, and sends the staff member scurrying to follow-up with an unresponsive author. It’s tour time, and the new recruits receive a warm welcome from Jae-min, and an equally cold one from witch number one, Yoo-sun. During a brief break, Park Hoon gushes about wanting to meet Eun-ho, and then asks Dan-yi how old she is. He cuts her off at just “30,” eager to note they are only three years apart, and then averts his eyes when she finishes “37.” Both of the young hires want to believe that she’s been working this entire time, or in school, but Dan-yi sticks to her story about only having a high school diploma. As the office tour continues, the group is stopped by the arrival of a large floral arrangement. It’s for new recruit Ji-yul, from her mother, and she proceeds to take a bunch of selfies with it. The Gyeoroo staff take in the scene, eyebrows raised at the mommy’s girl. Hae-rin promises to work hard to mentor her, ha. At the end of the day, Dan-yi smiles down at her new business cards. She thinks back to moments in her life when she was excluded from things or felt ashamed when she didn’t have a business card to exchange. Eun-ho spots Dan-yi on the sidewalk as he drives home, ruining her plan of sneaking into his house undetected. He offers to drive her home, which she tries to evade by distracting Eun-ho with her business card and running. But Eun-ho has the dowdy comments on his mind, and he catches up with Dan-yi and tells her to get in his car. He takes her to his ex-girlfriend’s clothing shop for a little shopping makeover. Dan-yi wonders if the two are back together, but ex-girlfriend Na-gyeong hints that they can’t get back together since someone cheated. Dan-yi automatically assumes it was Eun-ho, but Eun-ho reveals that it was actually Na-gyeong who cheated on him. 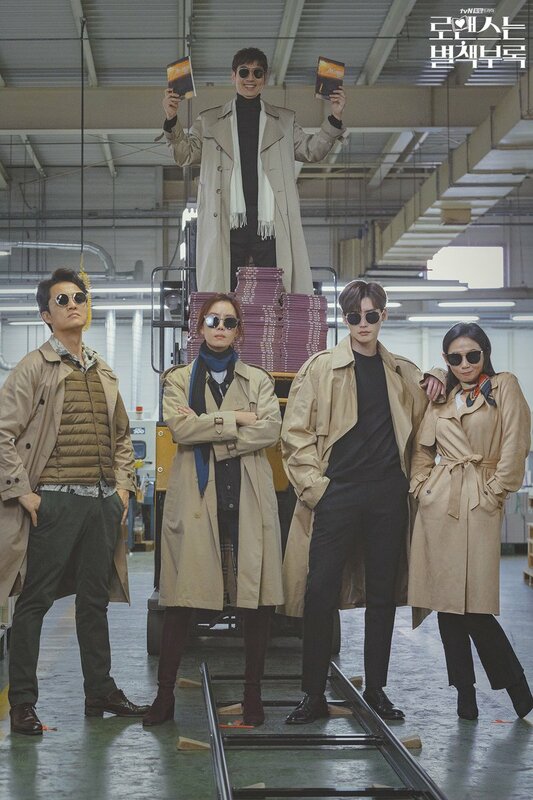 Dan-yi tries on a series of outfits until they find a style that suits her, Eun-ho seeming to ignore the entire process. Up next, Na-gyeong offers to take care of a haircut for Dan-yi. Dan-yi protests that the salon will be closed, but Na-gyeong is dating the salon owner, the very same person she cheated on Eun-ho with. Dan-yi is surprised to meet Joo-yeon, Na-gyeong’s girlfriend, and Eun-ho shrugs that it’s obvious he never had a chance in this relationship, ha. After the haircut, Dan-yi teases him that he let another woman steal his girlfriend, and Eun-ho deals it right back that Dan-yi let a woman do the exact same thing to her. Eun-ho wants to drive Dan-yi to her home, but she makes an excuse that she isn’t allowed to have men over and darts away. Eun-ho snuggles up at home with some work, and he can’t help but think of Dan-yi and how pretty she is when she smiles. Under his work papers, Eun-ho still has Dan-yi’s application questionnaire, and he moves on to question two: what are you most proud of? He smiles when he reads her answer, that she saved a boy’s life when she was in middle school. That boy is, of course, young Eun-ho, a grade schooler with a love, though maybe not a talent, for soccer. After a disappointing game, little Eun-ho drops his soccer ball in the road. He tries to retrieve it, and a speeding sports car heads straight for him. From the sidelines, middle schooler Dan-yi throws him to safety, while she herself is tossed into the air as the car hits her. Eun-ho stands over Dan-yi in the hospital. Thanks to her full body cast, Dan-yi won’t be attending school for a whole year, and she is delighted by this. She commands that Eun-ho work as her errand boy, which involves picking up stacks of books for her to read. Their friendship grows as they sit and read more and more together, laughing over the same stories. And thus, the two forged their friendship and secured Eun-ho’s new passion in literature. Now late in the evening, Dan-yi sneaks into Eun-ho’s house in hopes of making it to the spare room undetected. As Eun-ho locks up for the night, Dan-yi shuffles from corner to corner to avoid discovery. She seems to have made it, until Eun-ho hears a glass break in the kitchen in the middle of the night. He finds nothing in the kitchen, as Dan-yi hides on the other side of the counter, a big bowl of food clutched in her arms. Once Eun-ho retreats, she crouches down to clean up the broken glass. But Eun-ho’s no fool, and she looks up to find him standing over her. “Have you been living in my house?” he asks her, eyes wide. I’m going to do my best not to gush too hard about this show, but it’s going to be a struggle, because I am really enamored so far. There’s something about Lee Jong-seok that brings out the best in an ensemble cast. It’s not just that he’s a great actor, though he certainly is, but he adds this ease to any scene that he’s in that immediately elevates the performances of those around him as well. Everyone, from the leading lady to the smallest role at the publishing company, seems to shine as characters. There’s just so much to each character, but especially to our two leads. Eun-ho is a sports bro turned genre writer, while Dan-yi is a quirky lover of stories and accomplished marketing pro turned mother turned newbie. There is such nuance to their performances because they aren’t defined by just one thing. Eun-ho isn’t just a prickly childhood friend, and Dan-yi isn’t only a worn down housewife. These two have already lived half their lifetimes, as Dan-yi has pointed out, and so they have so much to take forward with them into the future, and to the story that will unfold in our future episodes. I love that while their pasts are intertwined, no one is in the dark about it. No lurking secret run-ins or shared relatives. These are just two people who have a shared history with one another, a long and meaningful one. How often do we see a younger version of our usual drama protagonists saved by a stranger, and never find them until much later? But here, it’s how their friendship is forged. Their connection is not used as fate’s hand to bring two destined souls together, but rather it’s the reason they know each other in the first place. And this meaningful friendship makes Dan-yi’s need to keep secrets from Eun-ho all the more poignant. They don’t need to be estranged former friends to keep secrets from one another, and instead this conflict is driven by complex emotions. Dan-yi and Eun-ho have been in what seems like daily contact for a while, but she still managed to keep her circumstances secret from him. It shines a lens on the idea that we can think we know someone so entirely, and still have no clue what they are going through. Eun-ho focuses on his love for Dan-yi so much that he doesn’t notice when things seem to be going downhill for her. He’s been so busy mooning over his one-sided lost love and his sad attempts to push other women away, his real love has managed to get divorced and lose her home. It’s not all Eun-ho’s fault though. Dan-yi’s pride and shame have been keeping her tight-lipped about things. It seems that Dan-yi has always had a hard time expressing difficult emotions, from the moment she tried to flee her wedding day, to her attempts to hide in her friend’s spare room rather than admit she needs a place to stay. But Dan-yi is no pushover either. Dan-yi isn’t a hapless heroine. She’s lived a whole damn life already, and she’s done feeling like things are out of her control. Dan-yi’s letter to herself was the best bit of self-care reminder for all of us. To forgive ourselves, and not be so hard on ourselves, and to not let others take advantage of what we give them. What I really enjoy about Dan-yi is that she doesn’t get caught up in her own pride. I can imagine the frustration of knowing how much job experience you have and not being able to talk about it, but she is just so grateful to be working again that those feelings don’t touch her. Yet. There’s still plenty of time for her to get upset about the politics of bureaucracy in the workplace, though I wonder if it’s more likely that Eun-ho will be getting upset on her behalf. The two characters both have a long way to go, and I’m glad for that. I don’t need perfect protagonists, or a lop-sided relationship with one person trying to be as good as the other human. They both need to grow, which means they get to grow together. I really want Eun-ho’s first series, The Bloody Contract to be super meaningful to the plot/romance. I so want it to be his giant love letter to his first love and all of the genre fiction that brought them together, and also perhaps Dan-yi’s rejection serving as the reason why he abandoned genre for more “respectable” writing. "..And my second talent... My talent as an author, began when I met an eccentric girl named Kang Dan Yi"
This thread is hotting up! Yay! Regarding this "noona-donseang" genre, if you could call it that, and its seeming popularity these days... I reckon it's really (as with all dramas regardless of the nation they emanate from) an exploration of people's sentiments without it in actuality happening frequently. My husband is younger than me, and interestingly, a number of our friends and acquaintances are in similar relationships too. We however remain the minority in our immediate social circle. So to say that such dramas are being produced because it's common, I should think it would be quite the opposite. Age is a very important part of the Korean cultural psyche and it's probably socially awkward or even unacceptable for younger men to marry older women. Yet, as this and many other dramas to date have explored and presented, there really isn't anything wrong with such a pairing except social conditioning. I remember my very first Kdrama and it was a noona-dongsaeng pairing - My Lovely Kim Sam Soon. The circumstances that led me to the drama was also one that I remember clearly - we had just been married not long and my husband was away on a business trip. So for the first time in our marriage, I was alone at home with my in-laws, and bored stiff. And the me who hardly ever turned on the TV, did. Lo and behold! My Lovely Kim Sam Soon was on! Hahaha... I remember at the time being very taken by the story, but more so, very baffled as to why a 3-year age gap between the younger man and older woman was such a big deal. In Something in the Rain, the relationship eventually failed exactly because of social pressures, which I think remain real in Korea and many other parts of the world. For all others I've watched, the story remains that such unusual relationship pairings won't work unless you are too, unusual. I'm liking the story so far because everything about this couple is so middle-class normal. The foundation of their friendship is one you can find in everyday life of everyday people. Their backstory circumstances are also not spectacular - people do suffer from failed marriages, fear of commitment, and missed opportunities because of unsaid social norms. So what is it that will eventually make them re-evaluate their personal norms and say, "Our relationship has indeed progressed. We've grown up and are no longer our middle school selves"? The other thing that the drama is exploring which I also observe has become more popular of late, is that of the "divorced woman". How does society continue to treat them? Why are the men not stepping up to make right what went wrong? In societies of old, you have this concept of the "kinsmen redeemer", someone within your extended family and community who will take care of you if you are somehow abandoned by the man who was to have taken care of you. Where are these people today? Single mothers left to their own while the men merrily skip off with another woman. The young men in these shows are stepping up. Is that a new hope in the next generation? It's interesting to note that many of these dramas that explore social issues are written by women. I remain fascinated by Kdramas because I find them being used as a platform for social commentary than just storytelling. As regards Cha Eunho's relationship with Kang Dani, @Ameera Ali yes, I too wondered how close their friendship is if she's managed to hide it all from him. As he himself remarked, how ridiculous is it that you got divorced and lost your house and I didn't know?! But when things get very difficult and you feel socially embarrassed by your circumstance, you hide it even from people you live with. Why would it be then that your closest would be suffering from depression and you wouldn't even know until the worst happens? Good for Dani that she eventually, while standing at the edge of her life (as she puts it), calls him and tells him. But then look at his reaction. It was probably that reaction that prevented her from telling him in the first place. Once upon a time, Cha Eunho tried to save Kang Dani from this inevitable end. It was clear from the start he did not like Hong Dongmin and probably in various ways tried to tell Dani that Dongmin was just all wrong for her. But she maintained the Noona status with him (right up to her telling him to watch his words because Dongmin was still her daughter's father) and he probably gave up on his advice to her. She did marry Dongmin after all, despite Eunho telling her to not walk down the aisle. With this as the backdrop, how could Dani tell him that the marriage did fail after all? "I told you so" is not something anyone wants to confront. And then, life happens. As one of the new hires (Park Hoon) at Gyeoroo observes, Cha Eunho is a lecturer, chief editor and popular podcast host. He runs three jobs when most people can't even handle 1! So while they have clearly maintained constant contact with each other through texting, he probably hasn't met her in a while (sounds like me and a number of friends I count as close), much less gone into a deep conversation with her. And that's why he's angry. He shouts at her when he finds out half of what's going on, but I reckon he's really angry at himself. Exactly, how could all this have been happening and I did not know? But in his defence, if you've been having this really close relationship with a female friend who's so much like a sister but not a sister, once she gets married, are you still her brother or a male friend whom her husband wouldn't quite like you hanging around as much? I have had such relationships before and once you get married, there is an unsaid common sense rule of engagement that tells you the distance must now be kept. I'm absolutely loving this show! (Eng sub) "Close Your Ears" - Lee Jong Suk (이종석) Lee Na Young (이나영) in "Romance Is A Bonus Book"
Went to see Lee Jong-suk (이종석, Lee Jong Suk) in the press conference for his new drama "Romance Is a Bonus Book" (로맨스는 별책부록). Right next to him was Lee Na-young (이나영, Lee Na Young), LJS's bias (ideal type) since almost his debut! BTW, Lee Na Young is the wife of top actor Won Bin and gave birth to a son in 2015. Have you enjoyed everybody the TVN TV drama "Romance is a bonus book" that was broadcasted first last weekend? The relationship of the main characters is delicately drawn and raised expectations for the next time! - Who is watching the drama in South Korea these days? See you tomorrow at 9 pm !! Cha Eun Ho (Lee Jong Suk) and Kang Dan Yi (Lee Na Young) proved to be charming characters in the premiere episodes of tvN’s new drama “Romance is a Bonus Book.” The story follows the persevering Dan Yi as she battles with the aftermath of her divorce and gloomy unemployment. With a stroke of luck and a lot of confidence, she lands herself a job at Gyeoroo Publishing House, where Eun Ho works. If you’re looking for a fun, dramatic, yet realistic rom-com then look no further. Here’s a list of things we loved and hated about the first two episodes! Warning: Spoilers for the premiere episodes below. She may be at her lowest point (divorced, unemployed, and homeless), but Kang Dan Yi doesn’t let that get the best of her. While she is constantly on the lookout for new jobs, she is smart enough that she won’t have to sleep on the side of the street. She craftily uses Eun Ho’s place to shower and eat. After all, she is the one cleaning it. Unbeknownst to Eun Ho, who thinks a housekeeper than Dan Yi recommended is cleaning his house, she is actually the one cleaning it (and using its resources). She also finds solace in her old home that is marked for demolition. After her husband’s business went bankrupt, they lost their house. However, she brazenly jumps the walls and ignores the keep out signs. While the situation certainly goes south, in the end she makes sure that she’s safe. She shows incredible perseverance and determination, and it’s these choices that ultimately lead her to find the temporary job at the publishing house! It’s awesome to see a leading lady who takes charge of her life while trying her best to keep her pride intact. The opening scene was a doozy. Not only was Dan Yi getting married to someone that was not Eun Ho, but Eun Ho was also playing the piano for her grand entrance. Temporarily, she becomes a runaway bride and hides in the back of Eun Ho’s car without him knowing, which allows them a brief moment by themselves. It’s here that Eun Ho tells her he’d take her anywhere else if she didn’t want to get married. He wanted to support her happiness, as it was clear she was having some cold feet. Is it really a rom-com if there isn’t some sort of childhood connection? Not only is there a grand role reversal where the guy is in love with the girl and she has no clue, but it turns out Dan Yi was Eun Ho’s life-saver. It was incredibly cute to see how Eun Ho’s never-ending crush began and developed through his humorous but tender meeting with Dan Yi. It will be exciting to see their connection grow deeper as the show progresses. Of course, this wouldn’t be a rom-com without comedy. The funniest scenes happened to come whenever we saw the group of Gyeoroo interacting. It was hilarious to see Seo Young Ah (Kim Sun Young) complain about the president (Kim Tae Woo) while she came in clad in slides and with hair rollers still in her hair. Watching the president call all the new hires was also comical and lighthearted. An iconic scene, however, is when new hire, Park Hoon (Kang Ki Doong) talks about Song Hae Rin (Jung Yoo Jin) being the second witch without knowing who she is. It will be amusing to see how everyone will become a team as the drama continues! An absolute stand-out part of this drama was when we discovered that one of Eun Ho’s ex-girlfriends, Na Gyeong left him for a hair stylist named Ju Yeon! The banter Na Gyeong shared with Eun Ho before the reveal was amusing and their friendship definitely added some fluff to the drama amongst all the sadness. This kind of representation seems rare in K-dramas and it was refreshing to see a glimpse of what will hopefully be the plot of a drama one day! With any luck maybe they’ll make a few more appearances in the drama as it moves forward! I know what you’re thinking. How can someone have second male lead syndrome when Lee Jong Suk is the lead? I admit, it seems crazy. But Ji Seo Joon (Wi Ha Joon) definitely seems to be a contender alongside Eun Ho! Not only does he swoop in like Prince Charming for Dan Yi, but he also shares with her a staple scene from any K-drama alike: an umbrella scene. How can your heart not be fluttering? While this isn’t exactly a negative, it will surely lead to heartbreak as it’s unlikely he will end up with Dan Yi. And admittedly, it is a little weird that he followed her around for the whole day to return her shoes. We’ll have to keep a close eye on him and hope he doesn’t turn out to be creepy (or worse, steal our hearts from Eun Ho)! Like any male lead, Eun Ho believes that love has betrayed him. Forced to watch Dan Yi marry someone he doesn’t approve of has made him as broody as ever. While he does have a soft spot for her, it was a little annoying to see him talk down at her due to his own personal frustrations. It was also off-putting to have him act so cold when she told him she got the job. Albeit, he did congratulate her in the end. Of course, he is only human and it’s only the beginning of the drama. Hopefully, his cold heart will soften and this behavior will become a distant memory. After all, we are definitely rooting for him! Did you watch “Romance is a Bonus Book”? If so, what did you like and dislike? If you didn’t watch it, are you going to tune in? Let us know in the comments below! kaityv spends most of her time watching K-dramas even though she should be writing. If she’s not watching a drama then she’s for sure binging BTS, iKON, and Red Velvet music videos. 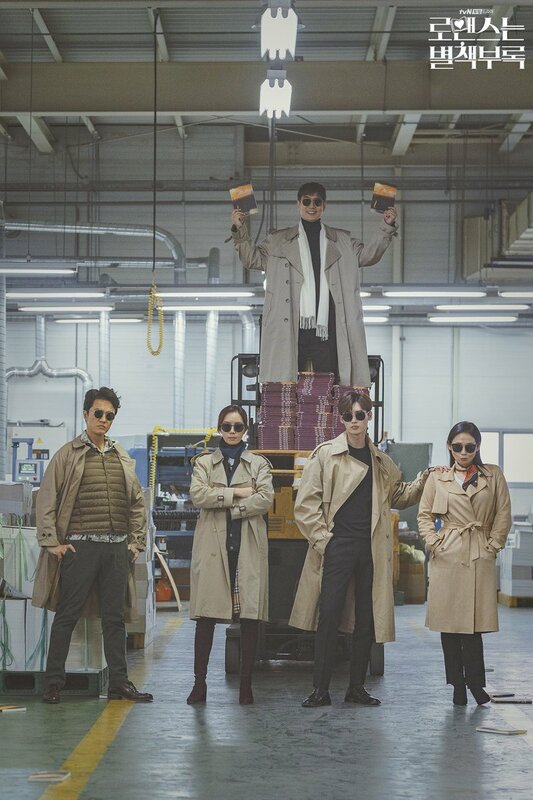 Looking forward to: “So I Married An Anti-Fan,” “Vagabond,” and Ji Soo‘s first proper lead role. That said, the first episode gave a little bit of whiplash. It started with a wedding, one that our leading lady, Dan-i (Lee Na Young), seemed to not want to get through, so why did she? Not only she had a successful professional career, she also had a loyal friend who would support whatever decision she made. So, really, why did she went along with it? Look, I’m no expert but if you get into the car of another man in hopes to get away from your own wedding, I don’t think the couple is on solid ground. Of course it’s no surprise the marriage didn’t last long but what was a low blow was the way how it ended. The pathetic excuse of a man Dan-i used to call husband, not only left her for another woman, who he went to live in another country, but completely abandoned all kind of responsibility he had with his own former family. On top things, his company’s bankruptcy left Dan-i with no house nor support that she could depend on until she could find a job, quite literally leaving her roaming in the streets. I can understand why she didn’t say anything to Eun-ho (Lee Jong-suk). The show has made it clear that in contrast to Dan-i’s struggles, his life has been quite comfortable and easy going so far. At least, on the surface, I’m looking forward to see if deep down this cynical behavior towards love is rooted on something bigger. Still, I think she should have reached out to him since she has a child to take care of and he seems to be a real friend who would lend her a hand with sincerity, until she could get back on her feet. And he did when he finally found the truth on the second episode, which was far better than the first. I think the show found its rhythm with the introduction of the rest of the characters which, by the way, it’s one hell of a solid cast. I have known these actors for years and I have watched many of theirs works, meaning that I’m expecting a really good rom-com drama. All the characters have already shown a lot of potential to grow and owning their own storylines, especially our leads who will have to figure out a new dynamic between them while they work together and live together, and share that special friendship that’s been brewing something else for a long time. Their chemistry is undeniable and I’m not afraid to say the best is yet to come! myself loving this drama…Must say, Lee Jung Suk looks perfect in his character. …matured & adorable at the same time…. The transition is so seamless…. around his house….dat too since long!! !